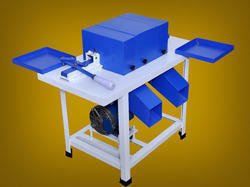 Offering you a complete choice of products which include kurkure production line and supari beetelnut cutting machine. By focusing on the changing desires of our customers, we are immersed in offering a wide range of Betel Nut Cutting Machine. Highly functional, long lasting and reliable, these offered products are made with perfection in tune with the set standards of quality. Besides this, their on-time delivery and reliability make these products highly popular. Looking for Automatic Processing Plant ?